Growing up, grilled cheese was never one of our favorite things. Plain cheese (usually American cheese) and bread was not usually an option that we picked. Now that we’re older, of course, we have realized that there’s a whole word of flavorful and delicious grilled cheese sandwiches that don’t involve processed cheese product and nothing else. If you’re a traditional grilled cheese fan, this sandwich will amaze you! It’s packed with tons of flavor (reminiscent of spinach artichoke dip), melty cheese, and crunchy sourdough bread. There’s really nothing better! 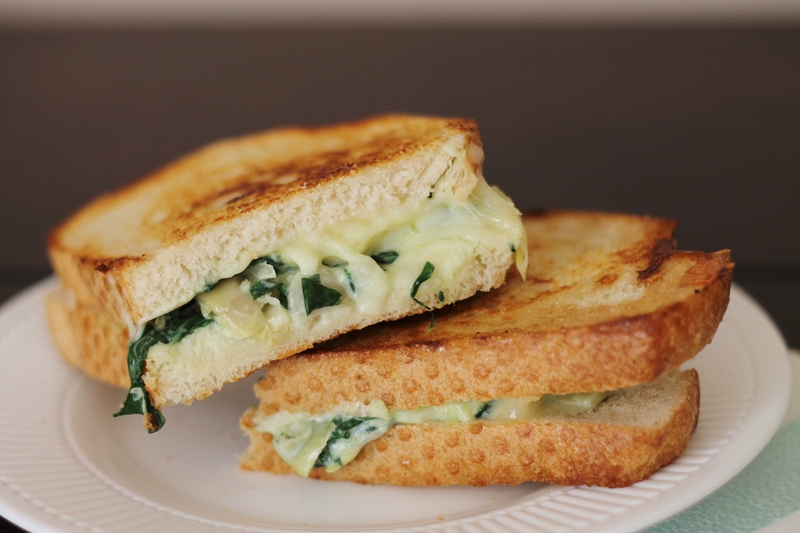 Plus, this meal is super easy, can be double or tripled easily to serve a crowd, and each sandwich boasts 1 1/2 cups of spinach (to make up for all that cheese!). If you have guests arriving for Thanksgiving, wow them upon arrival with a hot and delicious sandwich- they won’t be disappointed! Mince the 2 cloves garlic. Chop the artichokes. Wash and stem the spinach, then chop it coarsely. Heat about 1 tablespoon olive oil in a skillet. Add the garlic and saute for 30 seconds. Then add the spinach and a pinch of kosher salt, and saute for a few minutes until just wilted. Add the artichokes and saute for another minute or so, until heated through. Drain off any liquid from the pan. Stir in 2 tablespoons sour cream and another pinch of kosher salt. Heat a griddle pan to medium high heat and melt some butter on it. Place 2 pieces of bread on the griddle, buttered side down. On each piece, spread some shredded cheese, the spinach artichoke filling, some more cheese (1/2 cup cheese per sandwich), and the other piece of bread. When the bottom bread is browned, flip the sandwich and cook until the bread is toasted and the cheese is melted. Enjoy!